Cynthia Jurs is a Buddhist teacher in the Order of Interbeing who received Dharmacharya transmission to teach from Zen master Thich Nhat Hanh in 1994. Also a practitioner of Tibetan Buddhism, she has studied with many great masters and spent much time in retreat practicing in both the Vajrayana and Zen Buddhist traditions for 30 years. She is the guiding teacher at the Open Way Sangha, in Santa Fe, New Mexico, leading meditation groups and teaching retreats in a unique blend of engaged Buddhism and sacred activism. In 1990 Cynthia undertook a pilgrimage that transformed her life when she met a 106-year-old Sherpa lama living in a cave high in the Himalayas. 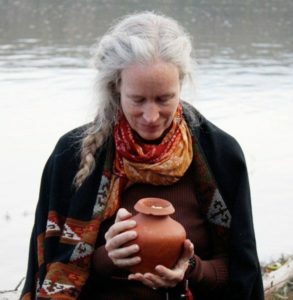 When she asked the old wise man, Charok Rinpoche, ‘What can we do to bring healing and protection to the Earth?’ he instructed her in the practice of the Earth Treasure Vases – a practice dedicated to bringing healing and protection to the Earth by filling consecrated clay vessels with prayers and offerings and burying them in places of need around the world. She was given 30 of these consecrated clay vessels and told to fill them with offerings and prayers, take them to places in need of healing and bury them according to the tradition.